Brand new from Patriot Ordnance Factory, you can now buy a POF-USA P308 upper in a variety of barrel lengths and finishes. This includes 16.5” complete 308 upper receivers in black, burnt bronze and NP3 finishes, one 20” .308 upper assembly in NP3 and a 14.5” and 12.5” also finished in NP3. Make sure to make note of which of these Patriot Ordnance Factory Gen 4 P308 upper assemblies will only fit the POF-USA P308 lower receiver. These upper assemblies all feature a 1:10 twist, match-grade fluted nitrated barrel, a triple port muzzle break and chamber 7.62 mm (.308) ammo. Each has a five-way adjustable gas block, except for the 14.5” upper, which has a three-way adjustable gas block. 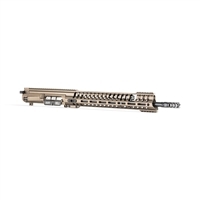 An upper assembly is unique to the AR-15 and M-16 firearm family and allows for a more custom-build feel for your rifle. Manufactured from only the highest quality materials, POF-USA ensures a seamless process for creating a topnotch complete upper assembly.